The Hitachi Unified Compute Platform* family, powered by Intel® Xeon® processors, helps increase agility, enhance efficiency, and deliver the performance required for big data. Change has become a constant across a wide variety of industries. To maintain a competitive edge, organizations today need IT solutions that can ...provide the agility to respond to change and the performance to generate insights from new data sources—all without adding complexity. Accommodating evolving business needs demands modern, dynamic, and agile IT. IT groups need solutions that can be deployed quickly—in days or weeks, not months. IT solutions must be able to capitalize on the tremendous potential of big data—the large and fast-growing volume, variety, and velocity of data available to organizations. Those solutions must be able to collect, analyze, store, and efficiently manage that data while conducting analytics and delivering results in real time. At the same time, many organizations need IT solutions designed to help simplify deployment and streamline ongoing management. Few organizations have the time, money, and expertise to integrate numerous infrastructure components and optimize systems. 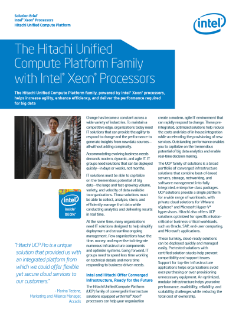 Read the full Hitachi Unified Compute Platform* with Intel® Xeon® Processors Solution Brief.